Background Up to 16% of hip dislocations have associated femoral head fractures, but if incongruency and instability of hip occurred this is an indication for surgery; intervention could range from excision of the fractured part, fixation, or even total hip replacement. Approaches may be anterior or posterior or transtrochanteric. Except for the surgical dislocation of the hip these approaches give limited exposure; surgical dislocation gives access to 360° of the head femur. Patient and methods A retrospective study for prospectively collected data, started by 23 cases and after exclusion of those cases treated conservatively or by excision, or any intervention other than fixation, there were 12 cases left on which the study was conducted. The study was held in Cairo University Hospital on 12 patients with traumatic femoral head fracture treated surgically by reduction and fixation, between November 2012 and June 2016. Results According to Matta reduction criteria, 11 cases had anatomical reduction, one case with imperfect reduction, according to Matta radiographic criteria at follow-up, four cases with excellent score, five cases with good score, three cases with poor score, according to Merle d’ Aubigne and Postel criteria, four cases with excellent score, five cases with good score, one case with fair score, and two cases with poor score. Conclusion Surgical hip dislocation allows inspection of the entire femoral head and the full circumference of the acetabulum for rigid fixation and debridement, with low incidence of avascular necrosis, while anterior Heuter approach to the hip joint is a simple, adequate, muscle-preserving, and viable option for open reduction and internal fixation of femoral head fractures with early rehabilitation. Femoral head fractures occur in about 16% of hip dislocations have associated femoral head fractures ; surgical intervention is indicated when there is hip joint instability or joint incongurance. Many approaches were described to treat fracture of the head femur: anterior, posterior, or even surgical hip dislocation which gives accessibility to the whole head . In the absence of randomized, controlled data, the choice of surgical procedure (which femoral head fragments should be fixed and what influence does an associated acetabular fracture have on this decision) and the choice of surgical approach is controversial . Most of femoral head fractures are treated operatively, but this decision is influenced by patient factors and by the nature of the fracture. Patient factors include physiological age, level of activity, bone quality, and associated comorbidities ; fracture type also affects the decision as for Pipkin type II, III, IV and displaced Pipkin type I surgical reduction and fixation should be done if possible ,. Anterior, posterior, and transtrochanteric surgical approaches have been proposed, but the exposure is limited with classical approaches, as the head of femur should be exposed without endangering the blood supply. Many hip dislocations have associated fractures, particularly of the femoral head, acetabulum, femoral neck, and shaft. In a series of 238 posterior hip dislocations, Brumback et al. reported a 7% incidence of an associated femoral head fracture. The primary goal in treating these injuries is a rapid concentric reduction of the femoral head within a stable acetabulum that is free of soft-tissue debris or bone fragments. In all hip dislocations, it is critical to evaluate the femoral neck for the presence of a fracture. Once this is excluded, emergent reduction is warranted to reduce ischemia time , preferably within 6–12 h from the time of injury . Postreduction imaging including an axial computed tomography (CT) scan with 2 mm cuts is necessary to ensure concentric reduction. Pipkin type I or II femoral head fractures, free, or nonreduced fragments that remain after reduction must be excised or reduced and stabilized to avoid early post-traumatic arthrosis . Historically, recommendations have included excision of large fragments, up to one-third of the femoral head . However, because the entire acetabulum is involved in weight bearing , the fragment that is amenable to fixation should be rigidly fixed and that small fragments can be excised  ([Table 1]). A retrospective study for prospectively collected data, started by 23 cases and after exclusion of those cases treated conservatively or by excision, or any intervention other than fixation there were 12 cases left on which the study was conducted. Fully informed Consent was obtained from all patients. The treatment protocol and the surgical procedure was approved from the ethical committee of our institution and followed the international standards. Patients were evaluated in the emergency department and basic trauma life support was adopted; primary radiological survey was done; and first-aid measures were performed. After stabilization of the patient, further management was performed; femoral head fracture with coexistent hip dislocation is a true emergency in orthopedic trauma and urgent reduction should be performed. History taking including mode of trauma, clinical examination including examination of the integrity of neurovascular bundle and radiological assessment (pelvis anteroposterior, inlet, outlet, Judet views and CT scan), and laboratory investigations were carried out. The fracture was classified according to Pipkins classification (five patients had Pipkins type I fracture, four type II, three type IV), nine were men and three were women, the age ranged from 22 to 47 years (mean age was 32.25 years), with a follow-up period that ranged from 12 to 61 months (the mean follow-up period was 35.83 months), mode of trauma was motor car accident in eight patients, fall from a height in three patients, and motor bike accident in one patient, associated with fractured pelvis in three cases, fractured femur in four cases, abdominal exploration in three cases transverse fracture acetabulum with posterior wall in one case, posterior wall acetabulum in one case, anterior column acetabulum in one case, with fracture fibula, tibia, metatarsals in other cases, impaction of the head occurred in two cases, and comminution of the head fragment occurred in three cases, surgical hip dislocation was performed in nine cases, anterior approach in three cases. With the patient positioned in lateral decubitus, under spinal or general anesthesia, a posterior Kocher-Langerbeck approach is done, and the posterior part of the gluteus medius is exposed together with the vastus lateralis, then the osteotomy is fashioned so as the proximal part is thick and stops at the upper border of the quadratus femoris, the capsule is exposed after retracting the tendon of piriformis ([Figure 1]). Figure 1 Trochanteric osteotomy: the proximal interval is between the piriformis tendon and the gluteus medius . The capsule is opened in a Z-shaped fashion extending proximally from the edge of the retracted piriformis and distally to the level of lesser trochanter, after the capsule is opened dislocation could be possible by external rotation and flexion; head is exposed and the joint could be examined ([Figure 2]). Any loose particles or even labral tear can be managed in addition to the reduction of the fracture part and fixation may be done by headless screws or countersinking small fragment screws; then the hip joint is reduced and the capsule is repaired after irrigation of the joint by saline, the trochanteric osteotomy s reduced and fixed by 3.5 or 4.5 screws ([Figure 3]). Figure 2 The Z-shaped capsulotomy incision . Figure 3 A 22-year-old male patient with fracture head femur, after falling from a height fixed through surgical hip dislocation. (a) Preoperative computed tomography, (b) preoperative radiograph, (c) postoperative radiograph. With the patient supine under general or spinal anesthesia, a sand bag is used to elevate the affected side; the anterior superior iliac spine is identified and the skin incision is fashioned below and laterally the anterior superior iliac spin for 10 cm length, opening the tensor fascia lata fascia the interval between the tensor fascia latta and sartorius is identified. 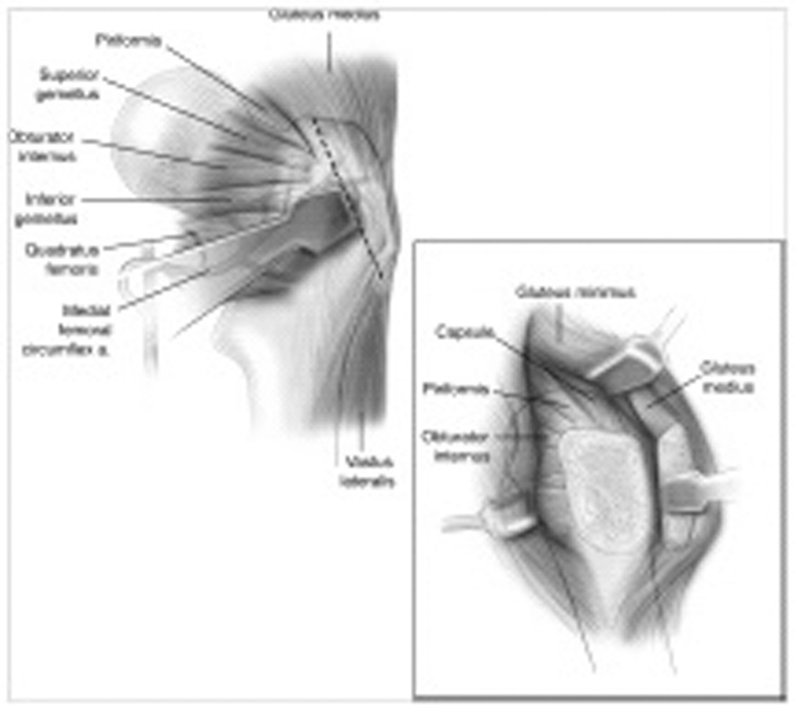 The tensor fascia lata with gluteus medius and minimus laterally and the sartorius and reflected head of rectus femoris exposing the direct head, and dissecting the direct head exposing the capsule which is opened in an H-shaped manner. 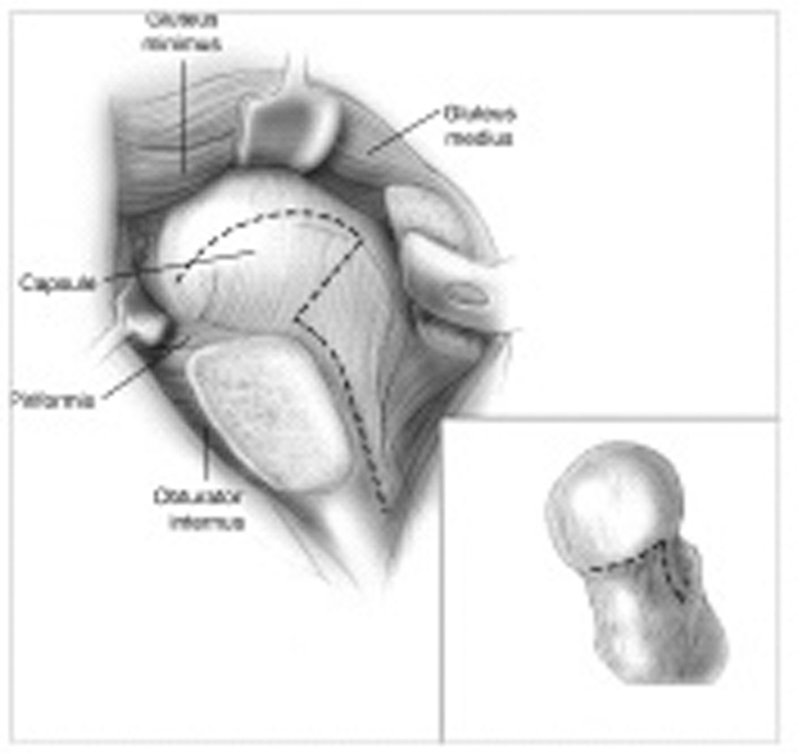 The fracture site is exposed by manipulating the hip and with some traction then reduction and fixation of the fracture, irrigation of the joint, closure of the capsulotomy, subcutaneous, and the skin were achieved ([Figure 4]). Figure 4 A 23-year-old male with motor car accident reduced and fixed through anterior approach. (a) Preoperative computed tomography, (b) preoperative radiograph, (c) postoperative radiograph. The patient is mobilized immediately, no weight bearing for 3 weeks was advised, crutch ambulation training with partial weight bearing is instituted for 3–5 weeks, strengthening and motion exercises are instituted and encouraged. Low molecular weight heparin is given for thromboprophylaxis during hospitalization until the patient is mobile, and is continued for 4 weeks. Indomethacin SR 75 mg daily is initiated postoperatively for heterotopic ossification prophylaxis. The study was conducted on 12 patients with fractured head femur treated surgical reduction and fixation, nine were men and three were women, the age ranged from 22 to 47 years old (mean age was 32.25 years), with a follow-up period that ranged from 6 to 61 months (the mean follow-up period was 35.83 months). The cases were assessed according to Matta criteria of reduction and radiological follow-up; also the functional outcome was assessed according to Merle d’ Aubigne and Postel criteria ([Table 2]) . According to Matta reduction criteria, 11 cases had anatomical reduction, one case with imperfect reduction, according to Matta radiographic criteria at follow-up: four cases with excellent score, five cases with good score, three cases with poor score; according to Merle d’ Aubigne and Postel criteria: four cases with excellent score, five cases with good score, one case with fair score, two cases with poor score ([Table 2]) . Osteoarthritis occurred in five patients; it varied from minimal reduction of joint space to severe osteoarthritic changes. Three cases were treated with conservative measure, one case occurred after avascular necrosis of the posterior wall of the acetabulum which needed eventually total hip replacement, another one in an epileptic case suffered from refracture of the femoral head and was revised by total hip replacement. Occurred in only one case of a male patient of 23 years old, who suffered from fracture tibia, underwent abdominal exploration and splenectomy, with excellent result of immediate postoperative reduction. He developed infection on the third week postoperative, underwent three sessions of debridement, infection resolved, but osteoarthritis developed and the patient developed fair functional outcome. Occurred in one patient, male, 33 years old, had type IV fracture head femur, associated with transverse posterior wall fracture acetabulum, fracture pelvis, and metatarsal heads, treated by surgical hip dislocation, with anatomical postoperative radiographs, developed avascular necrosis of the posterior wall acetabulum, subluxed hip and osteoarthritis ([Figure 5]). Figure 5 Avascular necrosis of posterior wall acetabulum. Occurred in one patient, male, 22 years old, epileptic (the injury occurred during a fit), and an addict, treated by surgical hip dislocation ([Figure 6]). Figure 6 Redislocation after epileptic fit. Occurred in two cases, both cases had done surgical hip dislocation, both were Brooker’s type II, both were treated conservatively, with final functional outcome being excellent and good ([Figure 7]). Figure 7 Heterotopic ossification Brooker’s type II. Femoral head fractures are uncommon injuries with a lot of unsolved controversies regarding their management . Although conservative management is left for nondisplaced infrafoveal fractures, operative intervention is otherwise indicated. The choice of the approach is a major issue of debate. Several authors have previously recommended a posterior approach for reduction and fixation. They were concerned about preserving the remaining anterior blood supply of the femoral head. They argued that the posterior injury had already disrupted the posterior supply and an anterior approach would leave the head completely avascular . In contrast, anterior approaches are now coming in favor, supported by the work of Ganz et al. on the anatomy of the blood supply of the femoral head. Anterior surgical hip dislocation and modified Smith-Peterson approaches are now the most widely used approaches. In this study, we tried to present our results in the operative management of femoral head fractures. We used surgical hip dislocation in eight patients and Heuter approach in four patients. Surgical hip dislocation has the advantage of giving us 360° access to the femoral head allowing accurate reduction and rotational alignment of the femoral head as well as elevation of impaction fractures. In addition, assessment of the femoral head vascularity can be documented. Moreover, direct visualization inside the acetabulum helped to debride the joint of any loose fragments and to assess the reduction of associated acetabular fractures. We found that the approach is particularly valuable in cases with associated acetabular fractures. As this approach uses the same skin incision as the Kocher-Langenbeck approach, simultaneous access anterior to the femoral head fracture and posterior to the column and wall allowed the whole injury to be treated utilizing a single approach; impaction fractures of the superior head in conjunction with an anterior dislocation, though rare, are frequently misdiagnosed . Subchondral depression is common, and although detectable on MRI, is rarely observed on CT scan . These subchondral depression injuries portend a poor prognosis by creating abnormal contact forces in the remaining articular cartilage, which predisposes to early arthrosis . Direct evaluation of these fractures is also facilitated using a surgical hip dislocation procedure rather than an anterior approach. Defects larger than 2 cm2 significantly increase contact stresses  and may be treated with elevation and bone grafting. In the absence of an acetabular fracture, this approach also allows direct assessment of the labrum, which may be fixed if possible or even excised. Heuter approach is a more limited approach through which the head cannot be dislocated. However, it is a very useful approach when dealing with minimally displaced fractures as appreciated from the postreduction CT scan. It has the main advantage that no single muscle is cut, it is a completely muscle-preserving approach. This is reflected in the more rapid postoperative rehabilitation and function restoration. In cases with associated acetabular fractures, large displaced head fractures and/or femoral head impaction, these are better managed through the more extensile surgical dislocation approach. Osteoarthritis and avascular necrosis are the main complications associated with this type of injury. Their incidence has been controversial through the literature. Giannoudis et al. in their systemic review paper have found their incidence to be 20 and 11.9%, respectively. According to Matta reduction criteria, 11 cases had anatomical reduction, one case with imperfect reduction, and according to Matta radiographic criteria at follow-up, four cases with excellent score, five cases with good score, three cases with poor score, according to Merle d’ Aubigne and Postel criteria, four cases with excellent score, five cases with good score, one case with fair score, and two cases with poor score. Epstein et al. reviewed a series of 10 patients all treated through anterior approach but all of them got poor results. So Epstein et al. recommended posterior approach for the treatment of posterior fracture dislocation hip with head fracture and Ganz et al. reported on 213 surgical hip dislocations followed for at least 2 years, and though none have shown signs of avascular necrosis, these were elective procedures without preceding trauma, and the results may not be directly applicable in the setting of a fracture dislocation, once the femoral head fracture is stabilized and the labrum is assessed, hip stability can be assessed by direct visualization and manipulation under anesthesia. Gardner et al. have used surgical hip dislocation in five patients with excellent results and no avascular necrosis. The use of the direct anterior approach for open reduction and internal fixation of femoral head fractures, the approach is simple, straightforward, and atraumatic. The exposure provided was adequate to obtain reduction and fixation. Benefits of the approach include its lack of muscle detachment. Neither the tensor nor the abductors need to be released, there are no osteotomies performed. The lateral femoral cutaneous nerve was easily avoided and spared. The joint can be reached in just few minutes leaving more time for reduction and fixation . This approach also give accessibility for reduction and fixation of fracture neck femur, which would be an efficient way to obtain an open reduction . Neither the trochanteric flip nor the anterior approach seems to put in more danger the femoral head blood supply compared with the posterior one, with the former giving promising long-term functional results and lower incidence of major complication rates . The main indication of surgical intervention for femoral head fracture is joint incongruence or instability. Surgical hip dislocation gives accessibility to the whole circumference of the head femur in addition to full examination of the joint for rigid fixation and debridement while minimizing the risk of avascular necrosis. Besides, the anterior approach to the hip joint is a simple, adequate, and dependable option for open reduction and internal fixation of femoral head fractures, which gives accessibility to neck femur in addition to open reduction and internal fixation, and muscle-preserving with early rehabilitation, but limited exposure. Hougaard K, Thomsen PB. Traumatic posterior fracture-dislocation of the hip with fracture of the femoral head or neck, or both. J Bone Joint Surg Am 1988; 70:233–239. Alonso JE, Volgas DA, Giordano V, Stannard JP. 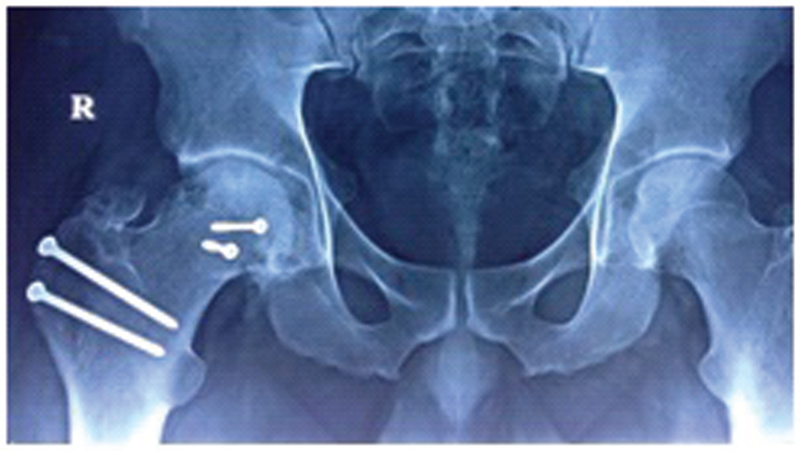 A review of the treatment of hip dislocations associated with acetabular fractures. Clin Orthop Relat Res 2000; 377:32–43. Gillespie P, Aprato A, Bircher M. Hip dislocation and femoral head fractures. In: Bentley G, editor. European surgical orthopaedics and traumatology: the efort textbook. Berlin; Heidelberg, Germany: Springer; 2014. pp. 2179–2202. Stannard JP, Harris HW, Volgas DA, Alonso JE. Functional outcome of patients with femoral head fractures associated with hip dislocations. Clin Orthop Relat Res 2000; 377:44–56. Swiontkowski MF, Thorpe M, Seiler JG, Hansen ST. Operative management of displaced femoral head fractures: case matched comparison of anterior versus posterior approaches for Pipkin I and Pipkin II fractures. J Orthop Trauma 1992; 6:437–442. Brumback RJ, Kenzora JE, Levitt LE. Fractures of the femoral head. Hip 1987:181–206. Sahin V, Karakas ES, Aksu S. Traumatic dislocation and fracture dislocation of the hip: a long-term follow-up study. J Trauma 2003; 54:520–529. Jaskulka RA, Fischer G, Fenzl G. Dislocation and fracture-dislocation of the hip. J Bone Joint Surg Br 1991; 73:465–469. Epstein HC, Wiss DA, Cozen L. Posterior fracture dislocation of the hip with fractures of the femoral head. Clin Orthop Relat Res 1985; 201:9–17. Greenwald AS, Haynes DW. Weight-bearing areas in the human hip joint. J Bone Joint Surg Br. 1972; 54:157–163. Gardner MJ, Suk M, Pearle A, Buly RL, Helfet DL, Lorich DG. Surgical dislocation of the hip for fractures of the femoral head. J Orthop Trauma 2005; 19:334–342. Qadir RI, Bukhari SI. Outcome of operative treatment of acetabular fractures: short term follow-up. J Ayub Med Coll Abbottabad 2015; 27:287–291. Siebenrock KA, Gautier E, Woo AK. 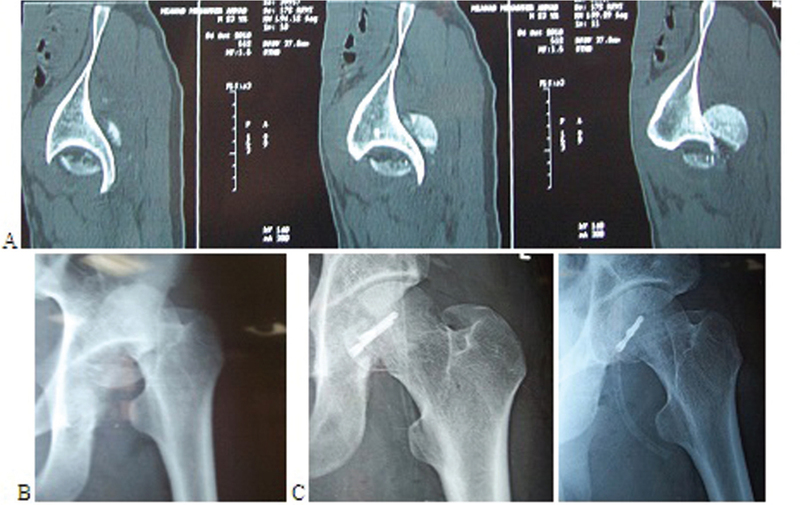 Surgical dislocation of the femoral head for joint debridement and accurate reduction of fractures of the acetabulum. J Orthop Trauma 2002; 16:543–552. 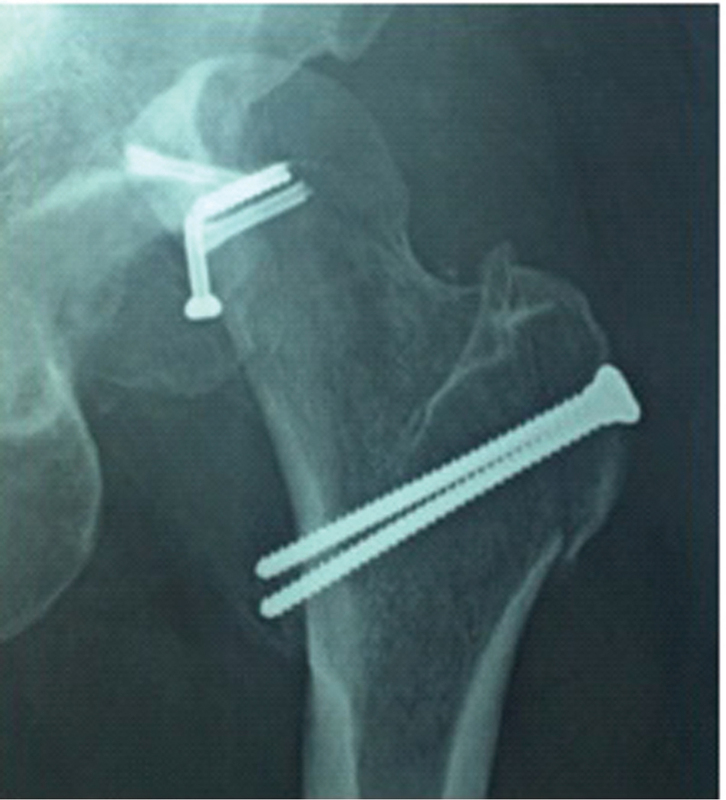 Ganz R, Gill TJ, Gautier E. Surgical dislocation of the adult hip a technique with full access to the femoral head and acetabulum without the risk of avascular necrosis. J Bone Joint Surg Br 2001; 83:1119–1124. DeLee JC, Evans JA, Thomas J. Anterior dislocation of the hip and associated femoral-head fractures. J Bone Joint Surg Am 1980; 62:960–964. Laorr A, Greenspan A, Anderson MW. Traumatic hip dislocation: early MRI findings. Skeletal Radiol 1995; 24:239–245. Konrath GA, Hamel AJ, Guerin J. Biomechanical evaluation of impaction fractures of the femoral head. J Orthop Trauma 1999; 13:407–413. Giannoudis PV, Kontakis G, Christoforakis Z, Akula M, Tosounidis T, Koutras C. Management, complications and clinical results of femoral head fractures. Injury 2009; 40:1245–1251. Kurtz WJ, Vrabec GA. Fixation of femoral head fractures using the modified heuter direct anterior approach. J Orthop Trauma 2009; 23:675–680. Haidukewych GJ. Intracapsular hip fractures. In: Stannard JP, Schmidt AH, Kregor PJ, editors. Surgical treatment of orthopaedic trauma. New York, NY: Thieme Medical Publishers Inc.; 2007. p. 539.